Vixen is a brash, arrogant griffon that wants to prove her worth to the world. She upholds the law to some degree, but she's mainly in it for beating up rebels and other shady individuals. Not to say that's she's unpleasant to be around. She's actually quite friendly as long as you don't make comments on her size. Though she is a bit suspicious around pony company as she sees them all for beggars and/or thieves. Her attitude towards superiors depends on the situation. If she is assigned a boring job such as guarding a door, she would seek more action or slack off on duty. She does not take well to being ordered around but will usually follow orders with minimal back talk when possible. She takes better to following orders from some griffon whom she respects. Born into a Aquillae family of fierce warriors, Vixen was the runt of the litter, and was named as so. All of her siblings were twice her size, and easily over-powered her every time. Vixen trained the hardest, but she could never defeat any of her siblings in battle. When the war started, she was prohibited from joining and forced to look after the house like a common slave. She ultimately ran away from home seeking to join the war by herself. During her journey, she encountered a griffon from the Aeryie house. Impressed with her determination, the griffon helped Vixen with her training. Together, Vixen practiced various different weapons, but nothing sat well with her. Though one incident sparked an idea in the Aeryie griffon. He developed a pair of gauntlets for Vixen to use. With these gauntlets, she was able to punch through even stone. 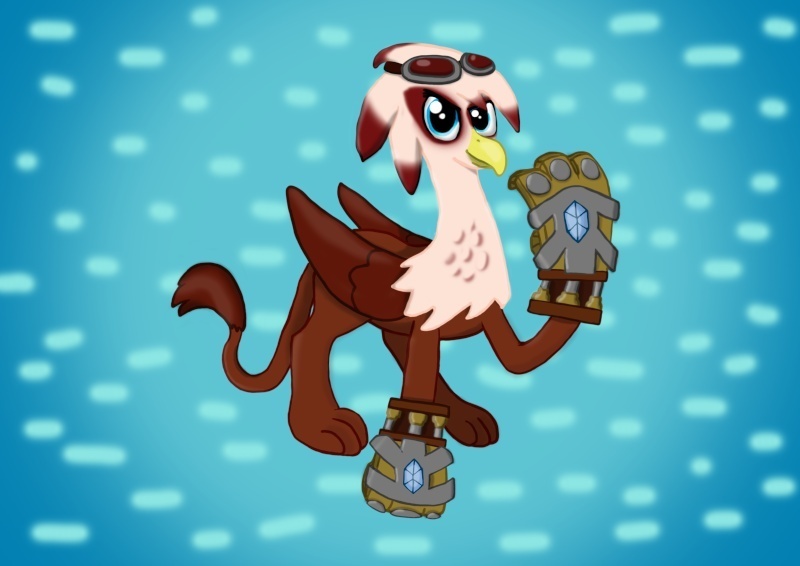 After a few modifications, Vixen parted ways with the Aeryie griffon. Vixen did not try go fight in the war, like she originally planned. Instead, she followed the Aeryie griffon's suggestion and sought after more inventors, seeking to further enhance her gauntlets. After a long journey, Vixen finally returned home with the improved gauntlets. Most of her family did not survive the war, but for the few that did... I wonder how it felt to have nearly every bone in your body broken. With her new power, she sought to join the military to prove her worth. Special Skills/Abilities/Spells Descriptions: Try massive gauntlets that can smash even rock (Not in one hit, but still impressive). Probably not as effective as cutting off somebody's head, but it's hard to move when all your limbs are broken. Only her punches are enhanced with the gauntlets. Other attacks such as slaps do not get enhanced. Though getting slapped with a giant metal gauntlet will still hurt a lot. Everything here is fine but you will need to send the gauntlets through the Artifact Registy if they have anything magical about them. If they are just gauntlets then not to worry.